A free-to-play "battle royale" spin-off of the Titanfall series, trading the series' trademark mechs for class-based last-squad-standing gameplay. Apex Legends is a free-to-play sci-fi first-person survival-shooter developed by Respawn and published digitally by Electronic Arts for the Xbox One, PlayStation 4, and PC (via Origin) on February 4, 2019. A spin-off of the Titanfall series, Apex Legends brings a modern "battle royale" twist (similar to PLAYERUNKNOWN'S BATTLEGROUNDS, the Battle Royale mode in Fortnite, and the Blackout mode in Call of Duty: Black Ops 4) to the fast-paced futuristic universe. As such, some of the series' traditional gameplay elements (including the Titan mechs and wall-running) have been scrapped. Each match features 20 three-player squads, with each squadmate as their own unique "Legend" (similar to Heroes in MOBAs or Overwatch). Each Legend has their own unique special abilities. Apex Legends has Seasons lasting for 3 months each that introduce new Legends, weapons, and a battle pass system similar to Fortnite's wherein players progress through a chain of cosmetic unlocks by playing the game. The battle pass can be purchased for 950 Apex Coins, and by progressing through it players can earn back enough Apex Coins to purchase the next one. 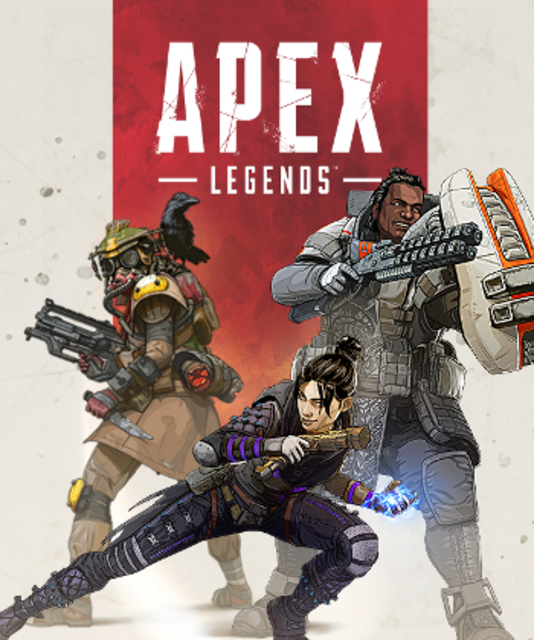 The first Season of Apex Legends launched on March 19, 2019, bringing with it the first battle pass and the first post-launch Legend, Octane. Apex Legends features a robust pinging feature that allows players to communicate in-game through HUD icons and character dialog. A single tap of the pinging button/key will place a neutral marker, while a double tap will call out hostiles in that area. Players can also hold down the button/key to access more options. All items in the world, such as weapons, ammo, attachments, ziplines, supply crates, and more, can be pinged to call them out to squadmates. Players can find a variety of weapons in the battlefield, each split into three ammo types (Light, Heavy, and Energy). While all weapons (with some exceptions) have the same rarity, weapon attachments vary in rarity. In rare occasions, players can find special Legendary versions of a weapon (known as Fully Kitted weapons), all of which have a unique predetermined set of attachments (none of which can be replaced). In addition, some of the more powerful weapons (such as the Mastiff and Kraber) are also Legendary, can only be found in Care Packages, have ammo that cannot be replenished, and cannot use attachments. R-301 Carbine (Light) - Fully-automatic assault rifle with a fast rate-of-fire. Can be toggled into semi-automatic for better control. VK-47 Flatline (Heavy) - Fully-automatic assault rifle with a slow rate-of-fire. Can be toggled into semi-automatic for better control. Hemlok Burst AR (Heavy) - Assault rifle that fires in three-round bursts. Can be toggled into semi-automatic for better control. HAVOC Rifle (Energy) - Fully-automatic assault rifle that must be "charged up" (by holding down the Fire button) prior to firing. Can use either the Turbocharger attachment (to completely negate the charge-up process) or the Selectfire Receiver attachment (to toggle into a unique semi-automatic "railgun" mode, which must also be charged-up, that delivers powerful precision beam shots for 5 ammo each). Added on February 20, 2019. R-99 SMG (Light) - Fully-automatic sub-machine gun with a fast rate-of-fire. Alternator SMG (Light) - Fully-automatic sub-machine gun with a slow rate-of-fire and less horizontal recoil. Prowler Burst PDW (Heavy) - Sub-machine gun that fires in five-round bursts. Can use the Selectfire Receiver attachment to toggle into fully-automatic. M600 Spitfire (Heavy) - Fully-automatic light-machine gun with a slower consistent rate-of-fire. Devotion LMG (Energy) - Fully-automatic light-machine gun with a faster rate-of-fire that builds up the longer it is firing. Can equip the Turbocharger attachment for a quicker build-up time. G7 Scout (Light) - Semi-automatic precision rifle. Sacrifices stopping power and accuracy for a larger magazine size and faster firing speed. Longbow DMR (Heavy) - Semi-automatic precision rifle. Can equip the Skullpiercer Rifling attachment for increased headshot damage. Triple Take (Energy) - Semi-automatic triple-barreled precision rifle with a fully-horizontal spread. Can equip the Precision Choke attachment to "charge" shots (by aiming down the sight) for a tighter, more accurate spread. Kraber .50-cal Sniper (Unique) - Bolt-action sniper rifle with very high stopping power and accuracy, at the cost of very slow firing. 4 shots per magazine, 8 shots total. Mozambique Shotgun (Shotgun) - Fully-automatic triple-barreled shotgun pistol with a three-pellet "triangle" spread. EVA-8 Auto (Shotgun) - Fully-automatic shotgun that fires in a nine-pellet "figure-8" spread. Peacekeeper (Shotgun) - Lever-action quad-barreled shotgun with a eleven-pellet "star" spread. Can equip the Precision Choke attachment to "charge" shots (by aiming down the sight) for a tighter, more accurate spread. Mastiff Shotgun (Unique) - Pump-action shotgun with chamber-fed reloading and a powerful eight-pellet fully-horizontal spread. 4 shots per "magazine", 20 shots total. RE-45 Auto (Light) - Fully-automatic handgun. P2020 (Light) - Semi-automatic handgun. Wingman (Heavy) - Double-action revolver with high stopping power. Can equip the Skullpiercer Rifling attachment for increased headshot damage. Bangalore, Professional Soldier - Sprints faster when taking enemy fire. Her Tactical Ability (Smoke Launcher) deploys a shoulder-mounted cluster of smoke grenades. Her Ultimate Ability (Rolling Thunder) deploys a beacon that calls in an artillery strike that, after a delayed fuse, damages all enemies (while slowing down and blinding all players inside). Unlocked from the start. Mirage, Holographic Trickster - Automatically deploys a holographic decoy (while cloaking himself) when downed. Can deploy decoys while using the jump-pack. His Tactical Ability (Psyche Out) sends out a decoy manually to confuse enemies. His Ultimate Ability (Vanishing Act) cloaks him while deploying a team of decoys. Octane, High-Speed Daredevil - Automatically heals himself over time (at a slow pace). His Tactical Ability (Stim) allows him to move faster and negate under-fire slowdown (sacrificing his movement and ability to aim down the sight). His Ultimate Ability (Launch Pad) deploys a platform that launches players forward. Added on March 19, 2019. Wraith, Interdimensional Skirmisher - Automatically detects nearby danger through "random whispers". Her Tactical Ability (Into the Void) allows her to phase through dimensions to dodge gunfire and make her harder to notice. Her Ultimate Ability (Dimensional Rift) deploys a portal at her position and allows her to run forward quickly to deploy a second portal for two-way teleportation. Unlocked from the start. Caustic, Toxic Trapper - Immune to the effects of Nox Gas (which normally damages, slows, and blinds players inside). Has Threat Vision against those in Nox Gas. His Tactical Ability (Nox Gas Trap) deploys up to six large canisters that release Nox Gas when shot (or when enemies are in close proximity). His Ultimate Ability (Nox Gas Grenade) deploys an impact grenade that releases a large cloud of Nox Gas. Gibraltar, Shielded Fortress - Can toggle a gun shield to block incoming fire while aiming down the sights. His Tactical Ability (Dome of Protection) deploys a dome-shield that blocks all gunfire. His Ultimate Ability (Defensive Bombardment) deploys a beacon that calls in a damaging smoke-filled mortar strike. Unlocked from the start. Lifeline, Combat Medic - Faster use of healing items. Improved revival speed. Automatically deploys a shield wall while reviving. Her Tactical Ability (D.O.C. Heal Drone) deploys a drone that slowly heals nearby players. Her Ultimate Ability (Care Package) deploys a supply-filled drop pod from orbit. Unlocked from the start. Pathfinder, Forward Scout - Can detect the next ring's location by scanning survey beacons. His Tactical Ability (Grappling Hook) deploys a grappling hook to quickly reach hard-to-reach places. His Ultimate Ability (Zipline Gun) deploys a zipline towards a chosen location. Unlocked from the start. Bloodhound, Technological Tracker - Automatically detects recent clues left behind from enemies (such as footsteps and blood residue). Their Tactical Ability (Eye of the Allfather) briefly reveals enemies in close proximity through walls. Their Ultimate Ability (Beast of the Hunt) temporarily grants them enhanced movement speed, improved clue detection, and Threat Vision. Unlocked from the start. 570: EA's Got a Fortnite!